MUSKEGON — Nestled between a photography studio and a garage on Washington Avenue, two blocks from the Henry Street railroad tracks, is the new sandwich shop and deli Fatty Lumpkins. “We were worried, on that first day when we opened the doors, that no one would come in,” said co-owner Jera Cook. Since Fatty Lumpkins’ launch on June 20, her fears have been quashed. Thanks to social media efforts — more than 400 Facebook fans since June — combined with neighborhood pride in local businesses, the deli’s opening season has been “better than expected,” according to Brett Gilbert, Cook’s partner-in-propriety. “Word of mouth has been key,” he said. The Muskegon natives, who attended Mona Shores schools, met during a short stint in Ft. Lauderdale, Fla., where they were working at beachside bars and restaurants. Each has a degree in hospitality management. In 2006, they came home to pursue their goals and started in 2008 by purchasing the property at 971 Washington. Despite the advantageous prospect of opening a business in sunny Florida, Gilbert recognized that hometown investment has its own unique advantages — namely, a friend- and family-driven support system. For example, Cook’s sister did some of the artwork at the deli; Gilbert’s father is there every day lending a hand. And in exchange for the support, Fatty Lumpkins, open 11 a.m. to 3 p.m. Mondays through Saturdays, intends to feed that village lunch. “We both work nights,” said Cook, who works for Muskegon caterer Harris Hospitality and as a manager at Pints & Quarts Pub and Grill in Norton Shores. Gilbert “moonlights” as a bartender at The Lake House Waterfront Grille in Muskegon and the Old Homestead Tavern in Norton Shores. In the mornings, however, it’s all about Fatty Lumpkins. While the only way to judge the food is by tasting it, consider the ingredients. The meats are grade-A Boar’s Head solid cuts, the homemade bread is from a top-secret local source, and the majority of the veggies are locally grown. “I go to the Farmer’s Market a lot, as much as I can,” Gilbert said. “Some of the stuff we can’t get there, though, like sprouts or arugula.” Buying locally “has a more direct impact,” in benefiting the area economy, he said. Fatty Lumpkins’ menu was a collaboration between foodies Cook and Gilbert who share a passion for delis. All of the dishes have a distinct Fatty touch, like the beach Reuben, prepared with coleslaw and real Russian dressing. Or try the sour cream and chive potato salad. Walking into Fatty Lumpkins, you might be taken aback by the decor. With an ostentatious color scheme and die-cut velvet wallpaper overlays straight out of the 1970s (discovered during renovation beneath layers of rotted wallpaper and paneling), the deli walks a fine balance between modern and vintage, classy and off the wall. It’s “chic, yet low key,” as Cook describes it. The name of the shop has been rumored to be a J.R.R. Tolkien reference; “Fatty Lumpkins” was the name of Old Forest resident Tom Bombadil’s pony in “The Fellowship of the Ring,” the first book of the Lord of the Rings trilogy. However, Gilbert said that’s not the case. “We weren’t really aware of that, but I think that association has definitely brought some (Tolkien) ‘enthusiasts’ into the store. Fatty Lumpkins was the nickname of an employee in one of our favorite delis, down on the beach in Ft. Lauderdale,” he said. The deli’s name is a homage to that man’s fantastic sandwiches, which continue to inspire the Muskegon entrepreneur, Gilbert said. 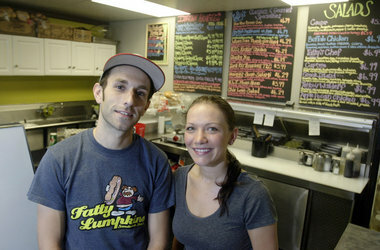 Who: Jera Cook and Brett Gilbert, co-owners of Fatty Lumpkins Sandwich Shack. What: Deli, sandwiches, vegetarian, outdoor seating. When: 11 a.m. to 3 p.m. Mondays through Saturdays. 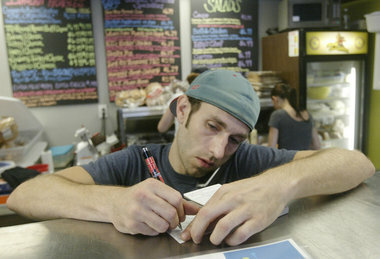 Stevens | Muskegon ChronicleCo-owner Brett Gilbert, 29, takes a phone order at Fatty Lumpkins Sandwich Shack, 971 Washington in Muskegon. The deli business opened in June. Ken Stevens | Muskegon ChronicleBrett Gilbert, 29, and Jera Cook, 27, are co-owners of Fatty Lumpkins Sandwich Shack, 971 Washington in Muskegon. The business opened in June. Gilbert is a 2000 graduate of Mona Shores and Cook in 2002. 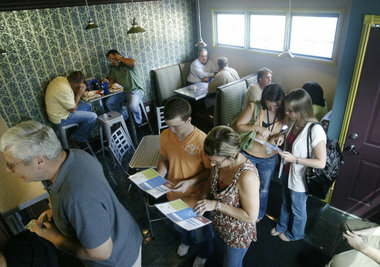 Stevens | Muskegon ChronicleCustomers wait to place an order and dine at Fatty Lumpkins Sandwich Shack, 971 Washington in Muskegon. Be warned: With crowds clamoring for sandwiches and less than 100 square feet of dining space, the ambience is slightly claustrophobic. Clever use of high tables, booths and stools astride a wall-spanning bar top gives it a feel of a cozy dining room, but shoulder bumping is always a lunchtime possibility. New business ventures like Watermark 920 and the Watermark Lofts kitty-corner from Fatty Lumpkins, speak volumes about the area’s new direction.